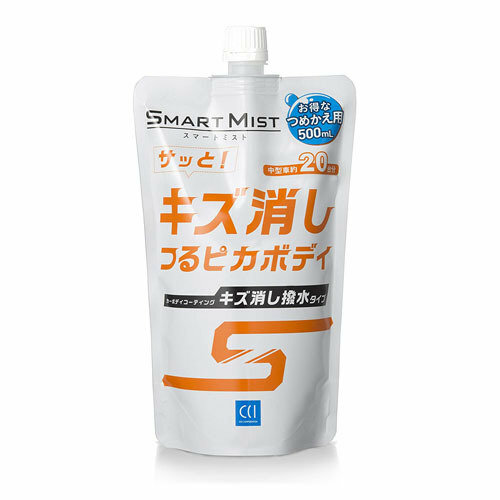 Economical refilling pack of smart mist scratch eraser repellent. Ideal for coating cars to restore wax repellency and gloss. Can be used on any prts such as wheels, unpainted resin part, glass, dashboard etc. 1. Shake well and open the cap. ※ If you open the pouch with a strong force, please be careful because the liquid may pop out. 2. Pour into the bottle. ※ Refill pouch is 500 ml (about 2 times of the 280ml bottle). Please pour a suitable amount according to the size of the bottle. ※ Please keep the remaining liquid tightly and store in a cool dark place.